Unfortunately, the last refuge for Nova Scotian bats from the devastating fungal disease white-nose syndrome (WNS) was the site of confirmed cases of the disease in little brown bats (Myotis lucifugus) this past surveillance season. In Inverness County, Cape Breton, NS, ten little brown bats – six females and four males – were found dead on the landscape at eight different geographical locations. Three bats were collected in December 2013; one in January 2014; two in February 2014; three in March 2014; and one in April 2014. All of the bats were submitted for testing on April 24, 2014, and laboratory testing confirmed WNS as the cause of death for all of them. In Cape Breton County, Cape Breton, NS, one male little brown bat was found dead on the landscape in March 2014 and was submitted for testing on April 9, 2014. Laboratory testing confirmed WNS as the cause of death for this individual. With Cape Breton falling to WNS as well as recent confirmation of the disease in Gaspé, Québec, there is now a real fear that WNS will emerge on the Island of Newfoundland, the last refuge from the disease for bats in Atlantic Canada. As a result, Newfoundland and Labrador will be closely monitored for any signs of WNS in subsequent surveillance seasons. Although this is sad news for Cape Breton, thanks to the website www.batconservation.ca, where members of the public can report bat sightings, researchers have discovered several previously-unknown bat colonies on the island. This announcement was released just days before the confirmation of cases of WNS on Cape Breton, but it still comes as hopeful news that there may be small pockets of unaffected bats in some areas of Nova Scotia. Since there are bats found in Inverness I assume you do not need a sample from Dundee? “Forbrigger”, We welcome all submissions! Please contact me at 902-628-4314 or by email, dweeks@upei.ca. My husband and I have a summer property in Fordview, Inverness Co. (East Margaree Road) and on two occasions in August we spotted a couple of bats flying around our deck. Such a small number of sightings compared to other years. We have a bat box, but we were reluctant to put it up in case it might contribute to the spread of WNS. This is a very sad situation. Thanks again for your observation and be sure to keep an eye out for these furry friends in the future! Our apologies for the delayed response! 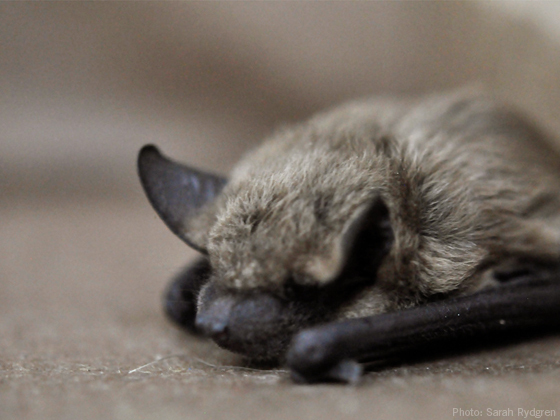 Although this message may have come too late for the current dead bat, incidents such as this can be reported to a CWHC regional office nearest to you (contact information can be found on our website: http://www.cwhc-rcsf.ca/contact.php) or our national information line at 800.567.2033.